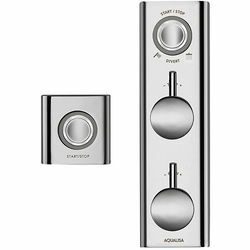 Aqualisa HiQu > Digital Dual Shower / Bath Valve With Remote Control (Gravity). 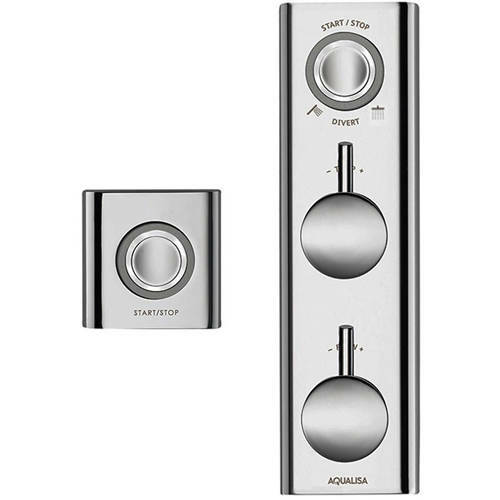 Aqualisa HiQu Digital smart dual shower / bath valve for gravity pumped systems (thermostatic). Complete with remote control. Thermostatic digital shower / bath (anti-scald). Two outlets for bath filler and shower head. Cool touch controls for added safety (no hot pipework at the control). Suitable for fixed shower heads or slide rail kit and bath filler spout (sold separately). 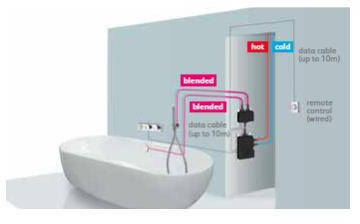 Controlled by a compact smart valve unit that can be installed in the loft, airing cupboard or under the bath. Valve blends the hot and cold water and controls the flow with smart precision to exactly the flow and temperature selected. 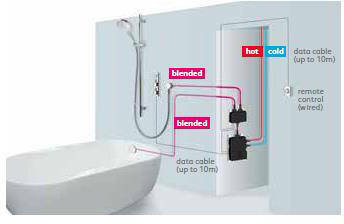 Valve unit can be located up to 10 metres away from the showering area (data cable included). Simple one touch start/stop control. Remote control can be installed up to 10 meters away from controller unit (data cable included, start/stop, LED, diverts). Powered by Aqualisa�s award-winning smart technology. Start/Stop and divert: Press button to start. Water will dispense to the preferred outlet at the flow and temperature set by the controls. Push and hold and the flow will divert to the alternative outlet. Light indicator to show when desired temperature has been reached. Flow control: For higher flow move water flow lever to the right, for lower flow to the left. Temperature control: Water will dispense at the flow and temperature set by the controls. LED: Temperature is increasing lights up Red and decreasing Blue. Light flashes white during flow increasing. Eco: Water saving without compromising your showering experience. Gravity pumped systems: Suitable for homes with low pressure gravity fed water systems. 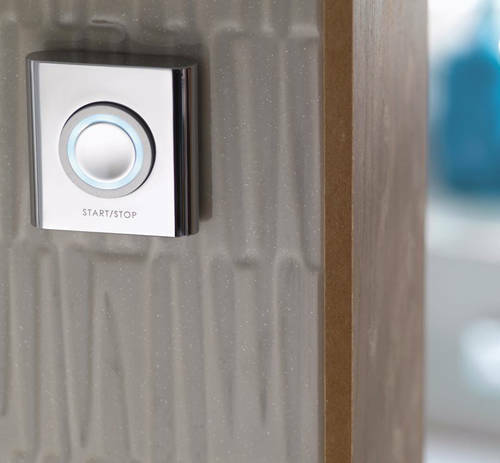 This smart valve integrates a pump to provide extra power. 5 Year guarantee: Aqualisa guarantee this smart digital shower valve for 5 years. The new HiQu smart digital showers from the Aqualisa Premier collection are as elegant as they are simple to use, whether you choose a HiQu smart shower or a HiQu smart bath shower with dual outlets. Its intuitive, sophisticated LED lighting and simple controls make it the perfect choice for both classic, contemporary and modern bathrooms. If you fancy soaking a little longer, go ahead and indulge yourself with HiQu�s bath top up function. It can add more hot water to bring a cooling bath back to the perfect bathing temperature. Aqualisa is one of the UK�s most successful shower manufacturers today. From the introduction of their revolutionary bi-metallic thermostatic shower valve in 1977 to the launch of the first digital shower in 2001, they have always been renowned for the highest quality showers, long guarantees and great customer service. Be inspired by Aqualisa's stylish bathroom showers! Copyright � 2015 Taps 4 Less Ltd, All Rights Reserved.